Our Port of Pascagoula dockside berths can handle multiple vessels concurrently. Coastal Cargo provides terminal and stevedoring services for the Port of Pascagoula, Mississippi. 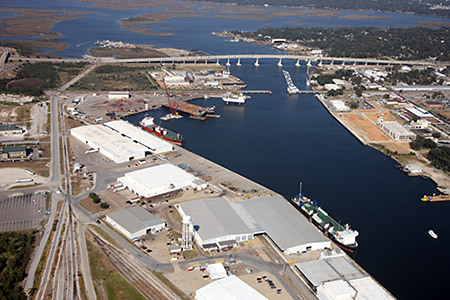 The facility is located 3 miles south of Interstate 10 in the West Bank area of the Port of Pascagoula, positioned dockside on a 38 foot deep channel allowing fast and efficient ship loading, as well as, dockside berths that can handle multiple vessels to be worked concurrently regardless of cargo. Coastal Cargo has a large inventory of diesel, electric, and LP rolling stock to insure that cargo is moved though our facility in a timely, efficient, and safe manner. Coastal Cargo in Pascagoula, Ms., utilizes experienced non-union labor allowing us to offer the utmost flexibility in meeting customer requirements. For more information on CCMS contact (228) 762-0208 or to request a quote by completing the quote request.